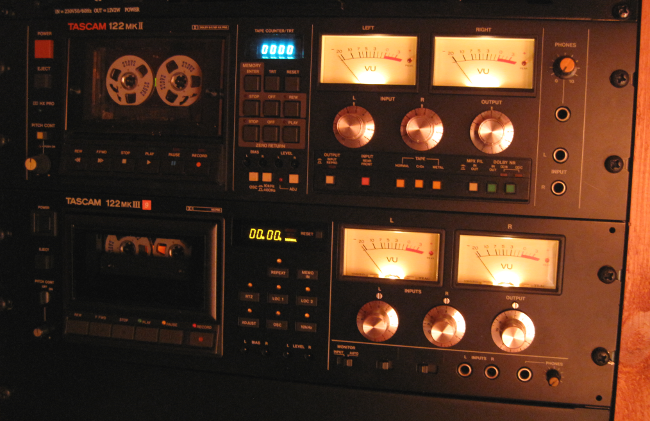 The ANT Audio Tascam 122 mkIII M9 is a rather odd mastering cassette tape recorder. It easily outperformes every other cassette tape recorder ever made or even dreamt of, while at the same time being incompatible with any other cassette deck since it runs at 3.75 ips and records with an unusual EQ, common for all tape types. This deck is the result of Alex Nikitin's efforts to take a fine professional cassette deck and turn it into a monster of audio performance. It is rebuilt using Alex's custom IC's and upgraded components, as well as having all the unnecessary stuff thrown out of the box, including the dolby system. Although this deck is incompatible with any existing cassette tape recordings, unless they were made on one of these decks, its sonic performance makes it ideal as a high quality, low cost, analog tape recorder, when the tape is going to be used as a source for the creation of other analog and digital media. Not only does it outperform all other cassette decks, but it also outperforms most reel-to-reel tape recorders as well. It can record flat from 20 Hz to 27 kHz with very low distortion and noise. This deck sees regular use at Magnetic Fidelity mostly during Direct-to-Master recording sessions and also for the creation of special effects.